VitalConnect and physIQ are teaming up with the Haga Teaching Hospital in the Netherlands to conduct a study on how wearable biosensors and artificial intelligence can augment care for cancer patients undergoing treatment. Specifically, the study — which is funded by Johnson & Johnson subsidiary Janssen Pharmaceuticals — is looking to see how the technology can detect adverse events in cancer treatment early on. 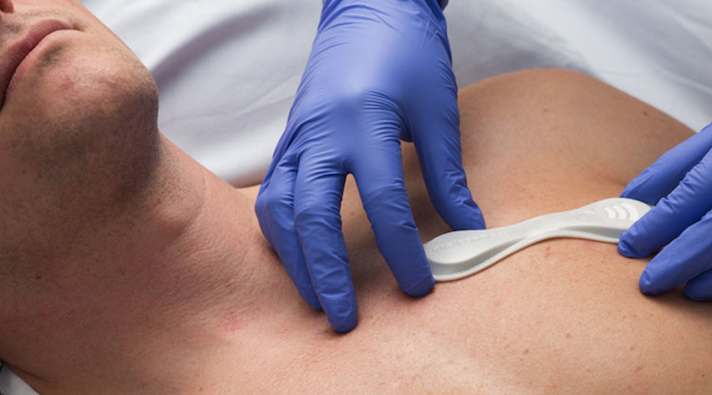 In the study, patients will be given a VitalPatch biosensor to be worn 24-7. That system will then stream physiological data via the cloud to physIQ’s AI technology, pinpointIQ. Patients in the study will be either be treated with erythrocyte transfusion or chemotherapy. Additionally, some participants will undergo immunotherapy and some will not. Part of the goal is to evaluate patients to their own baseline. Researchers plan to do this by giving participants the sensor before they start their treatment. This will give the AI a chance to develop a “pre-treatment personalized baseline.” Patients then continue wearing the sensor throughout treatment and after, allowing researchers to be able to continuously monitor a patients response through multiple stages of treatment. physIQ has been on the map for a while. A year ago the company landed $8 million in Series B financing. According to Crunchbase, this brings the startup to $19.9 million in funding. This isn’t the only study VitalConnect has been a part of this year. In March, a team of Dutch researchers presented data from a study at the Endocrinology Society’s annual meeting in Chicago that demonstrated how the company's HealthPatch MD could identify Type 1 diabetes patients’ hypoglycemic events by measuring heart rate. In addition to the study at the Haga Teaching Hospital, the companies noted that the pinpointIQ and VitalPatch technology have already been used in a number of hospitals and clinics worldwide.